Reactor is a game I've played before - more than 25 years ago on the Atari VCS (2600), at my cousin's house. It really made an impression, so much so that I remember it to this day. I figured I'd give the arcade version a shot. Upon playing it again, it doesn't take much time to realise that Reactor is very, very simple, but very addictive and challenging. There's really not much to it... you're in a ship inside a nuclear reactor, and you must destroy rogue particles whilst stopping the core from reaching meltdown. Gameplay is equally simple... to destroy the particles, you bump them into the walls, but they're trying to do the same to you. There are control rods on the walls... if you can bump the particles into those and destroy a complete set, the reactor will cool down and give you some breathing room. Reactor doesn't look like much at all, but it's a fun game from the times when you could never win, just hope to hold out for as long as possible and get the highest score you could. I actually think I prefer the excellent Parker Bros.' Atari version to the arcade version... it plays the same, but has some really harsh and jarring sound effects which add to the tension and scary atmosphere. 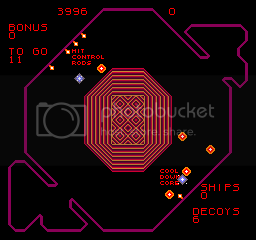 Whichever version you go for, though, Reactor remains a pretty entertaining game.